Huangshan or Yellow Mountain is in Anhui province, China. In terms of height is not the tallest mountain in China, but it has a high cultural significant to the ancient Chinese art and literature. When seeing this mountain in the fog, you can understand how it inspired and change the style of Chinese painting. It takes 5 hours to get there by train but we opt for an overnight carriage which leaves Shanghai Station in the evening and arrives Huangshan town in the morning. 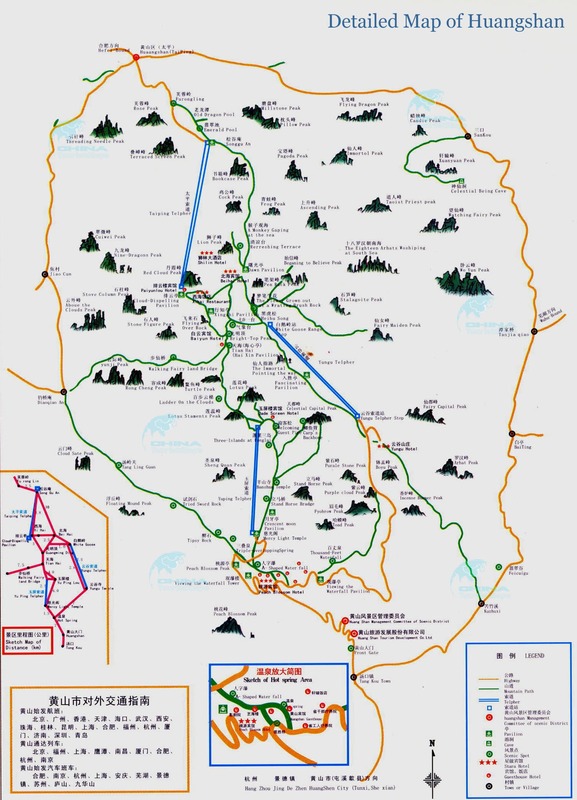 The mountain top can be accessed on foot or via one of the three cable car stations depending on which side of the mountain you are. The map can be found here at China-mike website. We took the Yuping Cable car with the plan to walk the whole loop and back down to the hotel from the same station. The weather forecast was cloudy and rain but we didn’t think that the whole mountain range was going to actually be in the cloud and rain. There were so many people and tourist groups around the station. As soon as you get away from it, you might be lucky enough to enjoy the scenery by yourselves. The local for some reasons doesn’t not seem to appreciate the sound of nature. Some will bring their own portable radio, some will shout and sing but most of the time you will hear one or sometimes many tour guides blasting their commentary on the loudspeakers. There is not much you can do accept try to avoid weekend or public holiday. I’m actually glad that we came on the foggy day. Aside from being wet and cold, the fog made the entire mountain disappear and suddenly re appear again. It was mesmerising to just stood there and watched. This is the essence of Chinese landscape painting, mountain peaks appear from the sea of fog, lacking in colour and detail. The area of West sea Canyon was probably the nicest of all. The route was breathtaking and there were hardly any people on it. If you plan to do a hike, plan ahead what and which route you will take. The distant may not to far but it is very narrow, crowded and always up or down some steps. Once you are on the mountain, there is no alternative but to keep walking. So check the cable car closing time as the last thing you want is to have to walk down the mountain. Bring walking sticks and waterproof, they will help you enormously.